Painting with the best paint roller can make a big difference in getting your jobs done quickly and efficiently. You don’t need to be a professional to do an expert painting job, it really just depends on what tools you use. By investing in the best paint roller system, you are setting yourself up to complete a successful painting job. What Painting Jobs are Paint Rollers Good For? Paint rollers are available in a variety of shapes and sizes. That means that there are a lot of projects that can be completed if you find the best paint roller. A quality paint roller is a great option when you are painting the ceiling or walls. This is especially true if it is a flat and smooth surface. In addition, many people will paint floors with a paint roller to save time. Paint rollers are also a great way to save money. There is very little waste associated with rolling paint and the supplies are generally cost effective. Let’s take a look at the advantages of using a paint roller over other common painting tools. A paint brush is a valuable tool when you are painting intricate details. It is also necessary when working on trim or other tight to reach nooks and crannies. These are areas that a paint roller cannot easily fit into. The question of a paintbrush or roller isn’t meant to be a “which one is better” because they both have a purpose when completing painting projects. Rollers allow for a quick and efficient way to cover large surface areas. Reaching high can require a strong back though so be sure to check out the weight of the roller. Take for instance a wall. It would take a far greater time to complete painting that wall with a brush than it would with a roller. Just as there are different varieties of paint rollers to complete a job, you’ll also find an array of brushes to suit any need. For the best paint job possible, you’ll want to use a variety of roller types and brushes. It can be a tough decision deciding between a paint spray gun or a paint roller. Paint spraying can be fast, but often includes a good amount of preparations. Rolling might be slower, but it will provide a more even coating than a sprayer. You don’t enjoy masking – There will still be areas you need to mask when rolling, but it is nothing compared to the preparation of spraying. You are painting interior walls but not the ceiling – Using a sprayer could mean paint on the ceiling. If you are only doing the walls, be sure to use a roller. You are trying to save money – Spraying paint is a quick way to invest a lot of money. A good amount of the materials gets vaporized and never makes it to the surface. When rolling, almost every drop of paint will be applied to the painting area. There is also the cost of buying a paint sprayer which is far more expensive than the supplies for rolling. You are painting a surface that isn’t clean – Rolling allows for some leeway when your surface isn’t spotless. That’s because the paint will apply thicker and bond easily. The atomized paint from a sprayer doesn’t connect with the surface in the same way rolled-on paint does. You are priming large interior spaces – Spraying is faster than rolling when you are working with new, large interior spaces. Since the primer is going to go on every surface except the floor, it won’t matter where the spray goes. 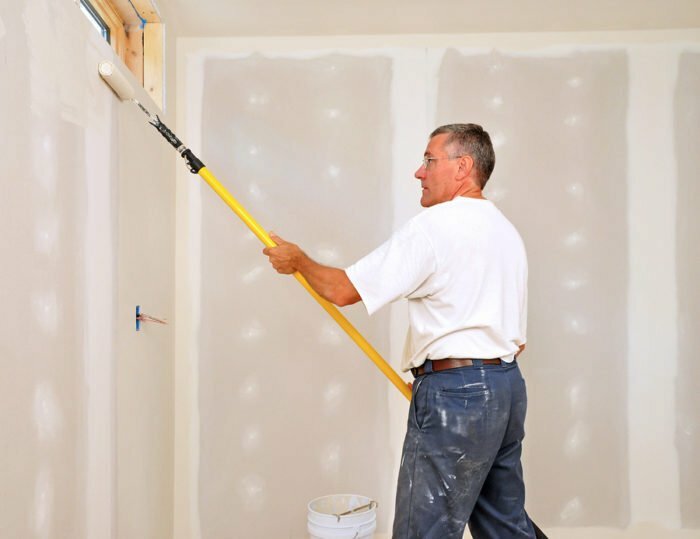 You are painting a new house or doing a full remodel – Spraying a new house or remodel is the best way to go as long as the floors or ceiling are not an issue. You are painting the exterior with a clear area – Painting the exterior with a sprayer is a good idea unless you have mature landscaping, sunrooms, garages, playsets and extensive decking nearby. Anything that is close to the painting surface will add more prep time. You are painting detail work – Sprayers can make quick jobs out of crown molding or popcorn ceilings. A paint roller is an application tool that is designed specifically to paint large, flat surfaces. The jobs can be performed quickly and efficiently. There are two parts to a paint roller, the frame, and the cover. The paint roller cover will absorb the paint and then transfer it to the surface. The paint roller frame attaches to the cover. You will hold the paint roller by the handle section. This part is reusable. Sometimes the cover is also reusable depending what kind is purchased. When you are standing in the home improvement store looking at paint rollers, it can be very easy to become overwhelmed. There are a lot of choices and options. Determining which one is right for your job can often be tricky. Your first step to determining the best paint roller for walls is to look at the roller cage. This is the skeletal frame that rotates for rolling motion. This is the area of the roller that will be covered. They are available in mini sizes all the way up to 12-inch and sometimes bigger. The mini, or often referred to as trim rollers, are great when painting woodwork or other small detail areas. When you are working on walls or ceilings, you will want a 9-inch roller. The larger your roller is, the heavier they are. Keep in mind that painting with a large roller will make you tire more easily. In addition, choosing a roller with plastic ribs versus cardboard is always a better option. They last longer and can be cleaned. They are a little more costly, however. ¼-inch nap – smooth or fine surfaces such as new ceilings, walls and trim. ½-inch nap – medium rough surfaces and most walls. Great for textured concrete or plaster. Most people will find that the 3/8-inch or ½-inch nap is the best general purpose roller cover while the larger sizes are the best paint roller for textured walls. Here are the picks for best paint rollers on the market currently. The best paint roller for a smooth finish could easily be this Stanley Kit. It includes a sturdy metal tray, clear tray liner, 9-inch 5-wire deluxe roller frame and two 9” x 3/8” high-capacity polyester rollers. It also has a 3” roller frame, 3” x 3/8” high-capacity polyester roller cover and 2” polyester long angle sash paint brush. This kit saves time because you don’t have to purchase each individual item. It also offers a smooth even application that you can trust since it comes from Stanley. The Stanley kit allows you access to a premium 8-piece set that offers all the same products used by a professional painter. Whether you are a DIY homeowner or handyman, this kit saves time while allowing you to perform a superior job. The 9-inch roller is the best paint roller for interior walls. It offers a wire cage roller frame for durability. There is also a quick release spring that prevents the roller cover from slipping. The Wooster Brush features smooth bearings to eliminate graying and shank wear. In addition, the durable green fiberglass reinforced nylon cage and endcaps set this roller a notch above the rest. This roller frame includes a comfortable full-size grip, threads for all extension poles and a no-twist Wooster Sherlock GT. The Wooster Brush Company has been in business since 1851 so you can feel confident purchasing their products. The best roller for painting walls tends to be a 9-inch, so this is perfect. In addition, they are generally the best paint roller for ceilings as well. The only downsides to this roller seem to be the noise level, which can be a little squeaky. It is also on the heavier side due to the wire cage roller frame. The Wagner brand has been a leader in the paint industry so it is no wonder they make the best electric paint roller on the market. The direct-feed delivery eliminates the need for a tray. This Wagner roller also offers an innovative click-attach arm to fit paint containers from 1 to 5-gallons. You can use the extension connection handle which accepts most common threaded extension poles. This helps to reach high walls and ceilings. The clean-up takes just about 10 minutes, so it is simple and fast to use. The Auto-feed control provides continuous paint flow. This means you receive on-demand paint for fast and even coverage. Use this for large or multi-room projects that would otherwise take a long time. It could also be the best roller for exterior painting. It can be used for both smooth and rough surfaces alike. This professional quality tray set is the best paint roller for painting kitchen cabinets. It is long lasting and also easy to clean. You can get the job done quickly while still achieving a beautiful finish. The wooden handle brush is lightweight and easy to hold. In addition, the paint roller features a hard, plastic handle for comfort during long jobs. These handles allow for quality control. The synthetic filaments found in the paintbrush hold more paint to save you time. The naps for the rollers are ½-inch thick and make for the best paint roller cover. Both the filaments and naps are durable to last for a long time. With this kit, it doesn’t matter what level of painting experience you have. It features a paintbrush, 2 paint roller naps, a paint roller frame and paint tray. It also has a paint can opener and paint can stirrer which many other kits don’t include. Finally, the roller contains a threaded handle so an extender can be used to reach high walls and ceilings. Looking for the best paint roller cover for interior walls can get confusing, but this option is a no-brainer. The 9-inch fabric nap roll cover offers a washable fabric. Easily clean it with soap and water and then they can be reused over again. This makes these rollers a great option for someone on a budget. The low cost also means you don’t have to feel bad about throwing them away when you are finished painting. They also come in a 6-roll pack for a great overall value when working on large projects. The fabric blend and density this cover offers is the best for superior coverage. The pile is air and vacuum treated to help eliminate loose fibers and lint. This means your paint job will remain clean and perfect looking. Sure, there are higher quality products on the market. For the price of these covers, this will help you find the best way to paint a room with a roller. Because of its tiny size, the RollerLite is the best roller for painting cabinets. The kit comes with a 3-inch Mo-Tech mini roller and a ¼-inch nap. It also features a reusable blue plastic frame and plastic tray with lid. This kit is lightweight and easy to use no matter what level of painting experience you have. The RollerLite is a best seller and versatile to conquer many projects. You can use this to touch up small finger marks on the walls. In addition, it will help you to cover those blemishes from a variety of surfaces. Some people even find it helpful for color testing purposes. This isn’t just the best roller for enamel paint, but also has been labeled the best roller for semi-gloss paint as well. Another great option from the Wagner brand! This telescopic pressure roller is the best roller for painting ceilings because of its long reach. It is made from 85% plastic, 5% metal and 10% polyester fiber. This telescoping power roller can also be easily attached to an airless paint sprayer. When taking on a large project, the inline trigger provides for maximum long-use comfort. This keeps your hands from cramping up in the middle of a job. Unlike many other rollers, this Wagner pressure roller features a one-year limited warranty. That offers some additional peace of mind with the purchase, especially since the price tag is a little high. When looking for the best way to clean paint rollers, this brand makes it easy. When using most latex paints, you can simply wash the roller with soap and water. Just be sure to let it air dry completely. This versatile paint roller can be used with all paints and stains. That’s one of the reasons it works as the best paint roller for epoxy floor paint. Just keep in mind that it is a smaller size at just 4-inches, so it is geared more toward touch-up jobs and covering blemishes. This roller features an ergonomic sure-grip foam mini roller and a 12-inch handle. When you are working on intensive projects, you’ll find that your hands experience less fatigue. his roller provides for an ultra-smooth finish that provides a professional looking paint job. The price is right especially when working on a quick painting job. Make sure you invest in a high-quality paint roller. They will last longer and give you better results. It can be tempting to use a bargain roller, but they often break or leave lint on your paint job. Choose a roller with a comfortable handle. You are going to be holding this for a good amount of time, you don’t want your hand to get tired and sore. Even, light pressure is the perfect way to get the best results. Clean your cover thoroughly. Use soap and water when using latex paint. Make sure you remove all the paint and then let air dry. Don’t soak the roller cover in water. Finding the best paint roller doesn’t have to be cumbersome. There are plenty of quality products available for purchase, the key is getting the one that suits your job the best.